Magnetic Humps are used where the flow of material is vertical. The material falling strikes directly on the first magnet changes direction and falls over the second magnet, ensuring clean outflow of material. The Magnets are of Hinged type and can be easily opened for periodic cleaning. 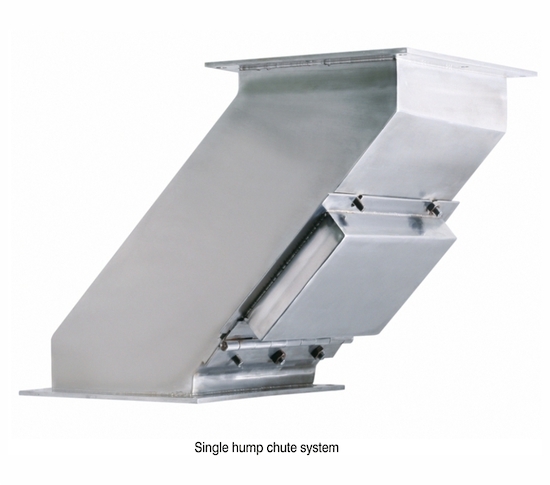 Hump Magnets can be supplied to suit any size of Pipe/Duct. Magnetic Hump Assemblies were designed to direct product and contaminant flow into the magnetic fields of plate separators. The deflected flow pattern helps to break up clumps of material, providing maximum protection against entrapped contaminants. 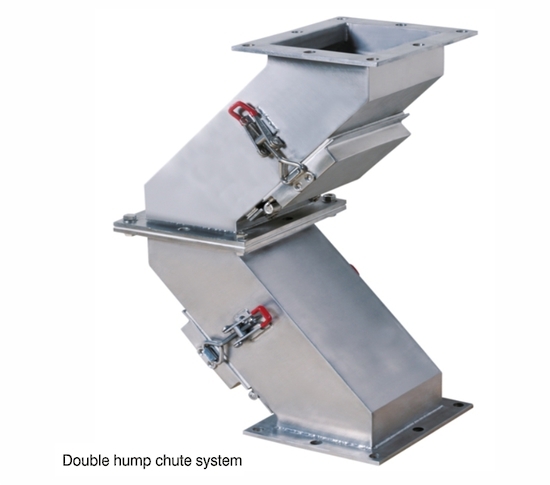 The hump separator is used where heavy, loose flowing materials such as fibers, chemicals, clay products, grain, feed and sand are conveyed in vertical, down gravity flow chutes. Whether installed vertically or horizontally, falling material strikes directly against the first magnetic plate and the subsequent change of direction permits the second magnet to remove any remaining tramp iron. The two Magnetic plates are hinged to swing out for fast, easy cleaning. Optional features include spouting adapters, all stainless steel construction and portholes for observation. 1.One separation unit from plate magnet. 304 or 316 stainless steel . 3.The angle shape directs the material flow into the magnetic field and prevent building up and bridging, and also break up clumps of product to improve efficiency of separator. 4.Simple structure,easy cleaning and assembling. 5.Inlet , outlet or other special requirement can be custom made. equipment. They can be mounted in spouting lines or on the processing machines. Half-Hump Magnets are developed for height restriction situation where full Hump Magnets can not be used.